Pub games are games played in or outside pubs and bars. These games are intended to entertain customers as well as to attract more pub goers. Here are some of the popular pub games. A pub quiz is a quiz held in a pub or bar. It is also called quiz nights, trivia nights or table quiz. The pub quiz is a modern example of a pub game and often attract customers to a pub. Pub quizzes are often weekly events and cover a range of formats and topics. Darts is one of the popular pub games in which small darts are thrown at a circular dartboard fixed to a wall. It refers to a standardized game involving a specific board design and set of rules. The standard dartboard is divided into 20 numbered sections, scoring from 1 to 20 points, with wires running from the small central circle to the outer circular wire. Circular wires within the outer wire subdivide each section into single, double and triple areas. Some of the popular dart games for pubs are Around The Clock, Cricket, and Golf. Bar billiards is a game that is almost exclusively played in pubs. It is a form of billiards which involves scoring points by potting balls in holes on the playing surface of the table rather than in pockets. This popular pub game originates from the game of ‘billard Russe’ in Russia which was brought to the UK in the 1930s. The objective of the game is simply to defeat your opponent by scoring more points than them by the time the game finishes. The game is played on a table that closely resembles a small Billiards table with 9 holes, 5 across one end of the table in a row and four in a diamond pattern on the other half of the table. Backgammon is not only one of the popular pub games, it is also one of the oldest known board games. It is a two-player game where each player has fifteen checkers which move between twenty-four triangles according to the roll of two dice. The objective of these popular pub game is to move all of your checkers around the board into your home board and then bear them off. The first player to get all their checkers off the board is the winner. The name Jenga is derived from kujenga, a Swahili word which means “to build”. In Jenga, players take turns removing one block at a time from a tower constructed of 54 blocks. Each block removed is then placed on top of the tower, creating a progressively taller and more unstable structure. This game involves physical and mental skill, making it an engaging and entertaining pub game. Another popular pub game is Tic-tac-toe. This game is also known as noughts and crosses or Xs and Os. It is a paper-and-pencil game for two players, X and O, who take turns marking the spaces in a 3×3 grid. The player who succeeds in placing three of their marks in a horizontal, vertical, or diagonal row wins the game. Poker is a popular pub game which belongs to the family of card games. This game combines gambling, strategy, and skill which makes it a perfect game for pub goers. All poker variants involve betting as an intrinsic part of the play, and determine the winner of each hand according to the combinations of players’ cards, at least some of which remain hidden until the end of the hand. This popular pub game involves swinging a bull’s nose-ring, which is attached to a string, in an arc so as to hook it onto a bull’s nose and hook. It must stay on the hook to count as a successful throw. The game is so simple that many pubs stage it simply as an informal pastime rather than as a competitive game. A person will make a number of attempts to ring the bull and then pass the ring to somebody else for a turn. Skittles, also known as Nine Pins, has always been a popular pub game and is the ancestor of related games including ten-pin bowling and various indoor skittles variations. The game involves nine small skittles arranged in a 3 × 3 square, usually within a shallow open-topped wooden box sitting on a table-top. The wooden ball hangs from a string or chain attached to the top of a vertical wooden post rising from one corner of the box. The aim of the game is to knock down the skittles by swinging the ball in an arc around the post. Each player has three attempts to knock down the skittles. This game makes for serious pub competition or just good old-fashioned fun for pub goers. Umqombothi is a Xhosa beer. It is traditional African beer which is made from mashed up maize or sorghum, malt, yeast, and water. It is high in vitamin-B and has a low alcohol content than most commercial beers. This beer is known to have a heavy and distinctly sour aroma and has a thick, creamy and gritty consistency. The beer is opaque and light tan in color. The Umqombothi is used to celebrate the home-coming of young men known as abakwetha in Xhosa culture, after the initiation and religious male circumcision. This beer is usually drunk in a communal setting where the drink is shared between friends and family during customary weddings, funerals, and traditional meetings. Witblits literally means “White lighting”. The South African drink is also known as firewater because of the strong punch it delivers. It is a clear spirit that has been distilled in South Africa for many years. Witblits is a grape-fermented homemade amateur brandy which is similar to moonshine and was originally made by South African housewives. It’s mostly produced and consumed in the Western Cape and made from a range of different fruits. Witblits is un-aged, meaning no maturation takes place which results in the liquid staying quite clear. Mampoer is an iconic South African drink which contains anywhere between 50 and 80 percent of alcohol. It is the fruitier alternative to Witblits. Mampoer is often called “Peach brandy” because it is often made with peaches. It is also made using other fruits which include plums, apricots, figs, pomegranates, pineapples, lemons or another citrus, even wild fruits such as the prickly pear, marula, milk-plum, Karee-berry or kei-apple. It is said to be named after the Pedi chief Mampuru and is most commonly consumed in the northern parts of South Africa. Groot Marico is said to be the Mampoer capital of South Africa. It’s a sweet liqueur made from sugar, cream and the fruit of the African Marula tree. The fruit is rich in vitamin C, potassium, magnesium, and protein. It is a favorite among monkeys and elephants who become intoxicated after consuming too much of the over-ripe Marula fruits. This sweet and creamy liqueur is generally drunk after dinner and can be added to anything from Irish coffee, to ice cream. Amarula looks a bit like chocolate milk when poured, and has a 17% alcohol content. Van der Hum liqueur is an original Cape citrus liqueur which combines spices, herbs, sugar, tangerines, pot still brandy, and diluted wine. This drink was named after its original creator, a Dutchman named Van der Hum. This South African drink is extremely aromatic and has a beautiful blood-orange color. Its syrupy flavor tastes great as a substitute for whiskey in a Manhattan or other old-fashioned cocktail. Van der Hum liqueur is a firm favorite amongst South Africans. Rooibos is a made in the Cederberg Region of the Western Cape and is shipped and sold internationally under the name of “red tea” and “red bush”. It is only grown in two specific valleys in South Africa – in the Western and Northern Cape. In addition, Rooibos tea has taken the world by storm over the last few years and is now available almost anywhere. The slightly reddish tea is packed full of antioxidants and is often added to other teas to enhance their flavors, such as other fully South African favorites like honeybush, hoodia, and buchu. If you are interested in visiting some of the coolest bars and pubs in the world, then a bar tour, also known as a pub crawl, is perfect for you. There are quite a few fun party towns such as Cancún, Rio de Janeiro, Munich, Ibiza, London and Phuket are just a few locations where people like to party hardy and are the best locations offering great bar tours. These tours are not going to get you up early in the morning and sightseeing is not on the agenda. The itinerary of these trips is all bar and pub based, any day-time trips, as well as local nightlife, are all on topic with visiting distilleries, breweries festivals or any events which are drinking related. During this tour over the span of twenty-five days, you will visit four continents, nine countries, and eleven cities. This is the ultimate travel and drinking experience! The tour begins in London and is basically an entire month of pure party, hammer time and one of a kind pub crawling to some of the most amazing party destinations in the entire world. This is a trip that you will not soon forget, one that will cause every one of your mates to boil with envy and, the stories you will be able to tell will legendary. This all-inclusive tour includes airfares, travel while on land, three-star accommodations which can be either double or single, breakfast included and of course, entree to bars and pubs. Departing from Munich, this is a power pub tour that lasts twelve nights and takes you to the best party destinations found in Austria, Germany, and the Czech Republic. It begins with three nights in Munich at the opening weekend of the Oktoberfest which we all know is the world’s largest beer fest! Next you will head over to Maria Alm, a tiny alpine village in Munich for to drink beer, spirits and wine by the meter, meaning that it is ten glasses at one time on a rack that is a meter long, this unique once in a lifetime experience takes place in the most comfortable pubs known to men. It is then on to Prague for some major hammer time! Prague is well known for its amazingly fine, yet inexpensive booze, here it will be a one night stop in Bamberg Germany. The next location is a bar tour of a street that contains over three hundred pubs end to end, this street is called the “longest bar in the world” and is located in Dusseldorf. Here you will have fun with the almost tens of thousand of people who party every night. Try a pub tour with a difference. Instead of driving, taxing or walking, this pub tour travels around by bicycle. This fully guided bike tour explores the micro brewery sensation that has taken off in Cape town, South Africa. You will see this unbelievably beautiful world class city by bicycle as well as taste some of the most delicious beers in the world on this bike beer tour in Cape Town. This twelve-night bar tour will take you to the hottest nightlife destinations in the USA, Argentina, and Brazil. Starting in South Beach Miami where you spend two night touring the hottest bars, then on to Rio de Janeiro followed by Buenos Aires where you can drink until your heart’s content at some of the most exotic nightclubs and bars in the world. Your 24-hour service is VIP, three-star accommodations and in Rio de Janeiro, you get to stay right on Copacabana Beach. Who can ask for anything more? Any of these popular bar tours is guaranteed to offer you an experience of a lifetime. Are you craving some classic pub food? If you are, you should head down to your local pub and see what they have on the menu. You can enjoy a good beer and some truly delicious foods. If you’re not sure what you should order, why not give one of these meals a try? These four dishes are pub staples. When people think about eating in a pub, they often think about fish and chips. Even people that don’t normally like seafood love the taste of crisp fish, especially when it is served alongside a plate of hot fries. If you’ve been craving this kind of food for a while, you definitely shouldn’t settle for something sub-par. Instead, you should hold out and have this meal at your favorite pub. Make sure that you ask for tartar sauce on the side! Burgers can be found at almost any type of restaurant, but they are especially popular at pubs. The great thing about burgers are all the options that they provide. You can order a burger with Swiss cheese and mushrooms, a burger with cheddar and bacon, or a burger with more unusual toppings. Strangely, in many cases, a burger can be one of the lone vegetarian options on a pub menu. It isn’t at all unusual to see restaurants serving veggie burgers to their patrons. Naturally, this burgers are served with the same fries diners could get with other types of dishes. On a chilly day, it can be great to have a hot bowl of soup to warm you up. Most pubs have several different kinds of soup on the menu. Many of them also offer rich, meat-laden stews. Some people opt to order their soup as a side dish. After all, soups pair wonderfully with sandwiches and other popular types of pub meals. However, it is perfectly possible to order a soup on its own. If you’re in the mood for something warm, see what kind of soups your favorite pub will be serving. Sandwiches are easy to eat, which makes them perfect for pubs. There are many types of sandwiches that are popular at pubs, and most of them contain some kind of meat. Reubens and Rachels are especially popular, but Club sandwiches also tend to do very well. In addition to traditional sandwiches, many pubs have sandwiches that are unique to that pub. Some of them use something unusual in place of bread. It isn’t at all unusual for a pub to serve a sandwich on a pretzel roll or a nice thick bagel. If you want a filling lunch, a pub sandwich is the way to go. These four pub meals are absolutely delicious and can satisfy just about anyone. If you’re interested in having tasty food in a relaxing atmosphere, you should definitely dine out at a pub. Ordinary restaurants simply can’t compete with the things that pubs offer. Pub quizzes are very entertaining. They are a good opportunity to broaden your knowledge on a wide range of topics while having a lot of fun. Learning and amusement can go very well together, the popularity of these quizzes being the living proof that learning can be fun. Since these quizzes are real institutions of the British culture, there’s no wonder they are so popular among all categories of people. Age, gender or walk of life, nothing makes a difference when it comes to participating in your regular weekly pub quiz. There are many people who don’t miss a week throughout the whole year, this is how addicted they are to their favorite entertainment. The amount of fun depends very much on the competing teams, but also on the choice of questions. The best pub quiz questions should be straight and simple, yet difficult enough to make participants use their brains. If they are too simple, nobody would have fun, as there’s always going to be someone to give the right answer within the first few seconds. If they are too difficult, they are going to become boring, as the audience wouldn’t be able to guess the answers. The ideal question should trigger laughing tears in the eyes of people in the room. This is where the great fun is, hence the importance of choosing the best questions when organizing a pub quiz. Some good questions are the ones that reveal unbelievable facts nobody would ever guess. For instance, if you ask how many drink combinations are there at Starbucks, the impressive answer of 87,000 may shock the audience. Nobody would expect to hear such figures. You may also tweak the question and ask the participants to name as many such drinks as they can. This can end up in laughing tears, as you can imagine some of the competitors are going to try to make up some names, hoping for a lucky guess. History and geography supply great questions, as many people enjoy reading about the various wars from our past or about the many countries of this world. Entertainment is also a good generator of interesting questions, as most people are genuinely interested in the life of various celebrities. These questions can also generate a lot of fun, as sometimes the competitors may provide unexpected answers, just to make the others laugh. When you design a pub quiz, you need to pick questions that inspire confidence. If all you can do is to induce intellectual panic, your audience isn’t going to be too active, so your quiz may not be too entertaining. On the contrary, if you choose things that can be answered by simply using the general knowledge one should get in school, the odds of success are much higher. You can start with simple questions such as “name the world’s biggest island” or “what is the longest river in the world” and work your way up to more complex stuff so that the teams feel more challenged. This is how the top five pub quiz questions should sound like. 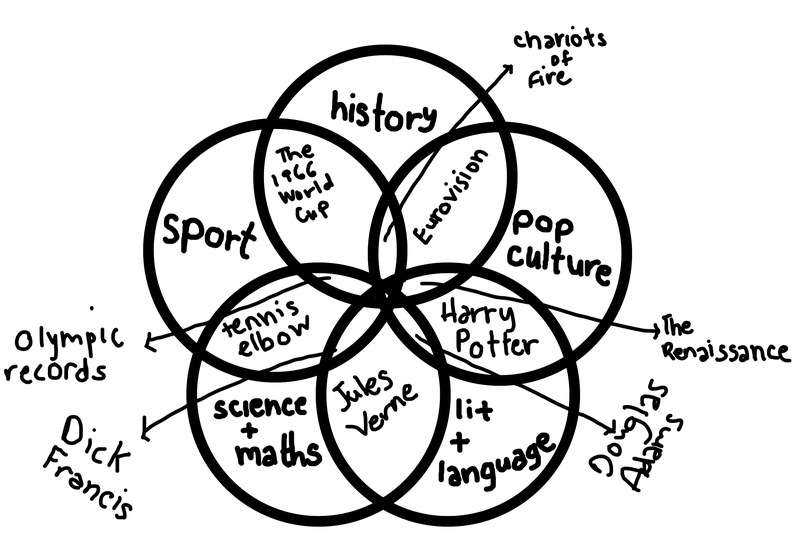 They should belong to likable fields such as history, geography or entertainment. They shouldn’t be too easy to answer, but not too difficult either. They need to include a twist of humor and the opportunity to generate some good laughter sessions among people in the audience. Of you want to design a quiz, you may want to test the questions beforehand by inviting some of your friends to read them and tell you their honest opinion. A little research is always good. We love to consider ourselves at Science in the Pub as enjoyable, expert, exciting and incredibly knowledgeable. The entire idea of Science in the Pub came to exist with our great passion to pub quizzes and pub tours around the world. Copyright © 2018 Science In The Pub.